The Wolf Creek Inn is listed in the National Register of Historic Places. It is among the best preserved and oldest active traveler’s inns in Oregon and is operated by "Oregon Parks and Recreation Dept". The Wolf Creek Inn is located 20 miles north of Grants Pass Oregon, on Interstate 5 at exit 76 in a small historical community. 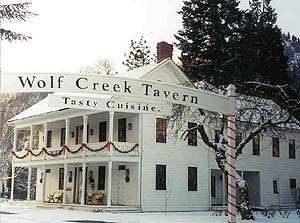 Wolf creek Inn has been called hotel, tavern, and inn. Today, the inn is run as a country inn. The original hotel was called Six Bit House, and it stood about a mile northeast of the community center. Recent research has shown that the building now known as Wolf Creek Tavern was built around 1883 for Henry Smith, a local merchant-entrepreneur. Wolf Creek Tavern was exceptionally well crafted by local sawyers and skilled workers in the building trades. It served local traffic to area mines and stage travelers connecting between Roseburg and Redding prior to the completion of the Oregon and California railroad through the Siskiyou Mountains in 1887. 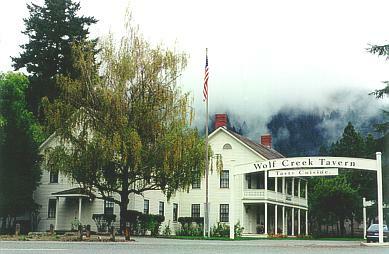 Wolf Creek Inn is the oldest continuously operated hotel in the Pacific Northwest. It is here that Jack London completed his novel "Valley Of The Moon." As an important stop on the sixteen days' journey from San Francisco to Portland, by stage coach, the Wolf Creek Inn has housed practically every important personage found in the Northwest during the early history of Oregon. Back in the early days of movies the Inn became a refuge for beleaguered actors seeking an escape from the demanding Hollywood studios. Mary Pickford found the Inn warm and comforting, especially when Douglas Fairbanks accompanied her on the visit. Clark Gable was a good friend of the innkeeper in the 1930's and stopped by several times while fishing the Rogue River just a few miles west of the Inn. Other visitors that have signed the guest register include Carol Lombard and Orson Wells. Between 1975 and 1979, the Inn was acquired by the State of Oregon and restored. Wolf Creek Tavern is listed in the National Register of Historic Places. It is among the best preserved and oldest active travelers inns in Oregon. Wolf Creek Inn during the holiday season. For More Business, Lodging, Real Estate & Recreation In This Area, Please Use Main Menu Above.